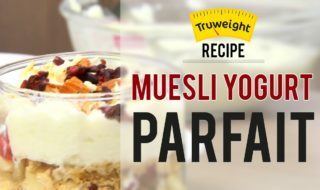 Enjoy this quick and easy fruit and muesli yogurt parfait for a delicious way to get your morning started! Truweight seeds and nuts muesli (honey) is an assorted cocktail of wholesome cereals, seeds, nuts, and honey. Try this for breakfast and you will not get disappointed! Peel and cut the kiwi into small pieces. Crush the Apple cinnamon bar into coarse powder. Keep ready fresh curd / yogurt. Take a stem glass and start layering the ingredients. Add a layer of fruit at the bottom, followed by muesli, fresh yogurt and the fruit again. Over it add the coarse powder of apple cinnamon bar. Repeat the layers until the glass is full. Note: Any fresh seasonal fruits could be used instead of Kiwi and pomegranate.